I was quite adamant to see this movie on IMAX and in 3D and not in some ordinary theatre. What surprised me was that the booking of the movie opened last month on the 15th. Yes, you read it right! That is when the enormity of the mania hit me. And to make things worse, the seats of the first week’s shows were filled within seven days! Yeah! Harry Potter is Britain’s Rajnikant. Anyways, back to topic. So, how did I manage to get the tickets, you may ask. Well, none of my flatmates are remotely interested in Harry Potter series. Yeah! I know! Just don’t get me started on this. Its as if they have just been freshly transported from Mars. And, then I decided to go alone. Believe me searching for a single ticket is much simpler because there are always one or two single seats left here and there. And, so, I booked my sole ticket on the 1st of July. I haven’t read the books. Now wait a second before you raise your eyebrows and widen your eyes. Its always better this way. A movie can rarely compete with a book. So its always good to watch the movie and then read the books. That way the movie won’t disappoint you. And that is why this movie was not at all disappointing. The first 15-20 minutes of the movie are in 3D. So, if you have a 3D theatre near your house, its worth watching the movie there. Its amazing! Although frankly speaking, I don’t understand why the whole movie was not in 3D? Atleast the climax should have been. Now, coming to how the movie was. The trailer of the movie might have given you an impression that its a very fast paced and dark movie. Apparently, its not. Infact, this might be the only movie of the series which was devoid of an over-doze of wizardry and action. It was more like a prelude of the sharp twists and turns which are about to come in the last two movies. I had a feeling that the director deliberately played it down. The climax was subtle, not rising to the chilling crescendo it reached in the previous installments. It was like the lull before the actual storm begins. There was more romance in the movie. The kids acted well! The sets were beautiful. I loved the scene where Ron is kissed by Lavender Brown, much to Hermione’s distress. She walks away and sits in a stairway and Harry comes and sit with her. She had birds fluttering over her head whom she throw towards Ron as darts. Then, there was this scene where Harry gets a smack on the head for saying – “But I am the chosen one!”. There was definitely a substantial amount of humor, love potions and weird coloured glasses. No. The movie was not boring. It had its own pace and you start enjoying it after some time. The story dwells into Voldemort’s past when he was a student at Hogwarts, the creation of the Horcruxes, Draco’s secret plans and Ginny’s and Harry’s love story(which started sooner than that in the book, they say) and the death of you-know-who. And yes, the tussle between Ron and Hermione continues with Lavender playing the third angle. Not the most brilliant of them all, but worth watching none the less. And, oh yes, I missed the animated creatures. There were none except for a huge dead spider! I am yet to catch the movie… maybe by next week I will see the movie.. Yes, someone told me that of all the book, this one has the least amount of action. Oh lord! I almost finished writing a draft of the movie review on my blog too! I watched it yesterday. Now I am an avid HP fan so this movie was a HUGE let down. Having read the book and knowing every little detail, the story unfolded in a very predictable manner, but that wasn’t what I was interested in anyway. There were some unrequired scenes in the movie, and they could have replaced those with some fights, Draco’s dilemmas and Dumbeldore’s memories. Oh anyway. My rating was like 2.1 or something. PS: Dumbeldore, the actor, retains his awfulness. Haha! Well, I am glad that I haven’t read the books yet. The movies never disappoint me. I have heard that there was a fight in the end which they totally underplayed. I don’t know what was the need for that? Booking of the movie started on 15th of last month ? Wow! thats news to me! LOL @ him wearing Rajnikanth style glasses! Well, none of my flatmates are remotely interested in Harry Potter series. i’m not surprised… i know quite a lot of ppl who cudnt care less. they think its all overhyped. So its always good to watch the movie and then read the books. smart policy, i’d say… no disappointment then. only the first 15-20 minutes are in 3D?? but why? i guess i’ll know the answer when i see it as well! i hope to catch the movie sometime this month. i’ve read all the books so i already know the story. for me its interesting to catch what part they edited out thanks to length problem. i m not surprised that they r making two movies to finish the climax … it incorporates a lot of things and fits in so many things for the climax. dont know how they will handle it tho. looking fwd to seeing it! Yeah! Last I heard something like that was when Sivaji was released. Well, I think the cost of the movie will go substantially high if it is all in 3D. Its only a guess but I am not sure. But those 15 minutes of 3D were great. That is the future of cinema. I think two movies for the climax makes sense. Otherwise they would have left out a lot of things. Nice review Amit. Have you not read any of the HP books or just the one this movie is based on, because my case is the later one, and I’m not sure if I should watch all the movies first or read all the books. To cut the long story short, I’m HP virgin and want to know how to take the plunge. I haven’t read any of them. Now I am thinking of picking up the ones for which the movies are already made. a) To watch a movie and crib that this scene or that scene was not there in the book. They altered things etc etc. b) To read a book and crib that this scene or that scene was not there in the movie. They should have made it differently. Vimmuuu hates flowers. You hate Harry! What is there to hate?!?!?!?! I am yet to see it though I wonder whether I’ll be able to watch it in a theatre anytime soon 🙁 Anyway I differ with your view that one should watch the movie first and then read the book. I think reading the book after watching the movie loses the charm of it and you start picturing how it was and try to fit the movie into it. Whereas reading a book afresh, you can feel the underlying themes and emotions, which I think is lost in the movie. Well, it happens both ways. If I read the book first then I will try to fit it in the movie while watching it. You have to decide which is less painful for you. Yeah! Truce! 🙂 I think if we stop comparing, then both are good in their own way. Then you will say, lo kar lo baat, he started the comparison and now he is asking to stop it! I have no idea about the Agatha ki gaatha. I have read only a few books and liked them. U already know my view on HBP so I wont comment anything. And yes as u havent read the book I guess u enjoyed more. I would like to share one incident of the crowd of my town…when Harry comes and sits beside her..the guys shouted “Chance maar le”….”mauka achha hai”..Sigh! Sadly I too know few friends like that and it really gets troublesome to go movies alone for a girl. I donno anything about this Harry guy and its time I did !!! The only way is to download all the old parts !!! Yes. That is a good move. I like it! Vimmuuu u hate flowers??? OMG!! U r dead inside! I hated the movie! They have murdered my fav book of the series! Grr I’m in outrage since a week now! People who have read the book are hating it! I will have to check this one out. Thank you for the tips. It would have been nice if it was faster but the idea of all the cool sets makes me really want to see it. And by the way, very eloquent in the description of the movie. It made me want to run out and see it right after I read your review. To be honest, I never enjoyed HP movies. I liked the Books to an extent but find the same shown on screen a bit shallow. To each his own, but not my kind of movie. i haven’t read any HP books yet and that’s why i like the movies.. i think it is better this way.. Yes, its a bit of a mad rush here. It was a miracle that I got the ticket even after 15 days since the booking started. Anyways, here I go again!!! Have seen only bits of one of the HP movie and didn’t like it for its darkness, blame it to watching it on CD or whatever but I didn’t like it. I still believe the love potion has been given more attention to than Horcruxes in the movie …. there is no building up to the half blood prince … at the end one seems to wonder why the heck was the movie titled “Half Blood Prince” …. Everyone acted well in the movie …. I really liked the character of Bellatrix with the ever so sarcastic smile of her … really well played !!!! Horace Slughorn and Dumbledore were brilliant too …. I agree. I think there was too much love. There was a dark side which was not explored properly. I wanted to see more of how the dark lord was when he was young. And yes, in the end, I was thinking – So Snape is the Half blood prince. So? What does that mean? Amit, I am one of those crazy fan of HP books and Half blood prince is my favorite part . For me ,this movie is a big disappointment in spite of all the striking visual effects. 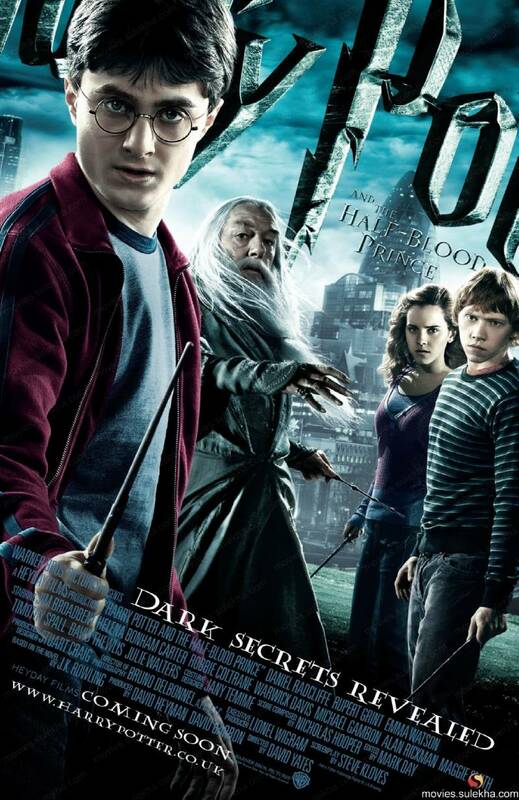 Dumbledore, Prof. Snape, Draco malfoy, Ron weasely, Tom riddle junior characters are played well in the movie. I wish that boy Daniel Radcliffe should do better at least in the next movie. I wonder why he has this half-baked looks at some scenes…eg. When Snape was announced as their Defense against dark arts teacher, this guy Harry is simply staring. He is supposed to look stunned, shocked and all. In fact I was the one who got stunned and shocked on seeing this scene. This movie should have explored Voldemort’s past in detail , instead for god-only-know-reason it has needless awkward teen romance. Phew ! it was disgusting to watch. I have read this book 9-10 hours with out a break, but I couldn’t watch this 2.30 hr movie. As Neha said here, they have murdered my fav book and i have been cursing since i watched this..
Well you are lucky to watch this movie before reading the book. Well, I guess, the director is the one who is supposed to tell the actors such things. As far as I know, its all written beforehand in the script, down to the minutest details. Reading of HP is a different experience. Anybody cannot picturise in 3 hours total content of book for sure. They are taking very important sequences and showing them nicely. As I told, I dont want to compare HP books and movies as both are dealt in different manner. Books dont have any constraints but movies will. I enjoy books and movies in different way. LOTR was an epic. It is one of the best adaptations ever. But then they could have done the same with HP. The series was immensely popular. They could have made a 16 series movie instead of 8 and got away with it. It would have been a great success too. you have made me excited to watch the movie…. Huh! Finally able to comment here. Dunno why couldn’t access your blog from office. Comin to HBP, I didnt like it much, but given that its HP, I can’t say so. When it comes to Harry I HAVE to like the movie at least for him. I simple adore the boy and the character. Of course for those who are like die hard fans, the movie was a bit of disappointment. I think it got mysteriously deleted. Yes, the 3D part is good. I was expecting the end to be in 3D too. Never mind. I am waiting to see a full action movie in 3D. That will be something. You have to consider lot of things if you want to increase the series. Main thing is age factor of the artists. I dont think people accepts if role of HP and other characters were done by different people like in case of bond series. Those children left an impression on people that they born only to play these characters. The movie however was very very disappointing. The climax was just plain wrong… Now, they will have to consciously leave out / mis-interpret incidences in the next couple of movies in order to make sure that their screw-ups don’t affect the way the story is told. I was so excited, the book does have a lot of action that the movie could have captured.